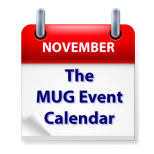 The MUG Event Calendar slows down for the holiday week in the U.S., with only a few meetings scheduled. A U.K. group will spend no more than 5 minutes on 25 apps, a Canadian group will examine Finder tips, and an Ohio group will look at ways to control your Apple devices. If you are celebrating the Thanksgiving Holiday, our best wishes to you for a safe and enjoyable time with your family and friends.